We’ve heard this statement made a lot over this US election cycle, but exactly how much truth is there to it? After researching this issue, not only is it true, it’s an understatement. She wasn’t just an architect, she was a chief instigator. Clinton’s main source of resume credibility is her tenure as US Secretary of State from January 21, 2009 to February 1, 2013. During that time, Clinton resided over the planning and conception of two devastating conflicts, Libya and Syria. These two disasters will ultimately define both the Obama and Clinton legacies, and not for the reasons one might think. I would like to stress that the case being made here is not a political one, it is a moral and ethical inquiry into the actions and conduct of a public official. Before we get into Libya, which itself is a detailed and grave tale of nation building gone wrong, let’s look closely at Syria – a conflict (not a Civil War) which has been dominating the international conversation for the last 4 years, but even more intensely in the last 18 months. Thus far, the results of US policy are abominable. What ownership does Clinton have over today’s Syria? Today, the conflict is still being fuelled by tens of thousands of US and Gulf-backed militants, mostly of foreign origin, who comprise multiple Takfiri terrorist groups which the US insist calling “rebels.” This conclave includes the Islamic State (ISIS/Daesh), Al Nusra Front (al Qaeda in Syria), Arar al Sham, Nour al-din al-Zenki, Jaish al-Fatah (The Army of Conquest), along with many others. These armed groups are occupying strategic civilian areas throughout Syria, and it is a statement of fact that these terrorists are using civilian populations as human shields. A US-led ‘Coalition’ is currently flying over Syria and Iraq, supposedly “fighting ISIS,” but is also coming dangerously close to conflict with both the Syrian and Russian militaries. Although this situation is now way beyond the pale, there was a time back in 2012 when a genuine diplomatic intervention could have helped to alter a fatal course of events. Hillary Clinton played a crucial role in initiating the current disaster. It’s a nice statement, but like so many of Clinton’s policy eulogies, it has no basis in reality. Clinton’s job, like most US diplomats, was to uphold the public facade that Washington is engaging in its usual list of honorable pursuits like ‘cease fires, ‘peace plans’ and protecting human rights – while simultaneously helping to advance a covert agenda that achieves the exact opposite: destabilization, escalation of violence, flooding the region with weapons, and of course, working to overthrow the government of Syria. We want to pay special attention to the weapons trafficking part. Clinton was pivotal – not only in coordinating with the Gulf states, but also giving political legitimacy to arming the “moderate rebels” (now commonly recognized as terrorists). Perhaps the most important aspect of this story is this: it is absolutely illegal under International Law for foreign nations to conspire and trafficking arms into a country with the intent to overthrow the government of a nation-state. Now that might be a cause for concern for those wanting to recognize the international rule of law, but the United States, the Obama and Clinton regime has done this without any compunction at all. History shows however, that such overt flouting of international law places the entire basis of the Geneva Conventions and the United Nations at risk. Beyond this, it is also a running violation of US law in terms of providing material support (weapons, cash, supplies, intelligence and logistical support, and even political backing) to internationally recognized terrorist organizations. On those two points alone, Hillary Clinton should be not only disqualified for public office in the US, but should also face another criminal indictment for her role, along with every other US public official involved in sanctioning these operations, including Barack Obama, Senator John McCain, and a number of other US officials like Mike Rogers, former Republican Congressman from Michigan and chairman of the House Intelligence Committee when Timber Sycamore began. government officials in 2012, conspiring to destroy Syria. From 2011, Secretary of State, Hillary Clinton was effectively the public-facing CEO of the cynically titled, ‘Friends of Syria.‘ This was essentially a lobbying tour, bringing together NATO members, the Arab League and the “Syrian Opposition” all together to promote a policy of regime change for Syria. In reality, it was really a vehicle for raising money and planning for war. Here Clinton was flanked by her Saudi Arabian and Qatari donors to the Clinton Foundation, along with then UK Foreign Secretary William Hague, Turkey’s prime minister, Recep Tayip Erdogan, a hand-picked puppet government-in-exile called the ‘Syrian National Council,’ and other ‘stakeholders’ – all vying for a piece of Syria. “.. she joined Saudi Arabia, Turkey, and right-wing Israelis to try to isolate, even defeat, Iran. In 2010, she supported secret negotiations between Israel and Syria to attempt to wrest Syria from Iran’s influence. Those talks failed. Then the CIA and Clinton pressed successfully for Plan B: to overthrow Assad. When the unrest of the Arab Spring broke out in early 2011, the CIA and the anti-Iran front of Israel, Saudi Arabia, and Turkey saw an opportunity to topple Assad quickly and thereby to gain a geopolitical victory. Clinton became the leading proponent of the CIA-led effort at Syrian regime change. The US demand that Assad be removed and sanctions be imposed before negotiations could seriously begin, along with the refusal to include Iran in the process, doomed [Annan’s] mission. Despite the billions spent on arming and training ‘rebels’, the millions of refugees and the hundreds of thousands dead – Assad did not “go” as per the grand plan. Things continue to go septic. A recently released WikiLeaks email from a 2014 exchange between Clinton campaign chair, then White House advisor to President Obama, John Podesta, where the pair openly discuss common knowledge that the governments of Saudi Arabia and Qatar are funding ISIS terrorists. Aside from verifying what many already suspected, this proves that the Clinton Foundation knowingly accepted millions of dollars in ‘charitable’ donations from the same Gulf states which both Secretary Clinton and President Obama knew were funding ISIS, Al Nusra Front (al Qaeda in Syria), and the rest. Taken as a whole, this represents a level of corruption that would preclude anyone from running for office, let alone the US Presidency and yet, this issue receives very little airtime in the US. The reason for this is simple: both Democrats and Republicans are up to their neck in Washington’s Dirty War on Syria. When the initial Benghazi story broke in the US, the media and the Republican politicians focused almost exclusively on the US casualties during militant raids on a CIA annex and makeshift US embassy in Benghazi. Four men died on September 11th and 12th, 2012 – U.S. Ambassador to Libya J. Christopher Stevens, U.S. Foreign Service Information Management Officer Sean Smith, and CIA contractors Tyrone S. Woods and Glen Doherty. Ten others were wounded in the fighting. During the aftermath, US media and GOP opposition made the story all about Hillary Clinton and the White House’s ‘failure’ to send reinforcements which they argue could have “saved American lives.” While this may have been true, it ignores the real story. This diversion was done in order to steer the narrative away from the bipartisan effort to traffick massive amounts of illegal weapons from Libya, and into the hands of US-NATO and Gulf-backed ‘rebels’ in Syria. We now know that Clinton’s diplomat Christopher Stevens was providing diplomatic cover for a CIA operation to transfer ex-Libyan military weapons stocks over to Syria. Many islamist fighters who fought with NATO to bring down Gaddafi in 2011 were later transferred from Libya to Syria to fight against the Syrian government. “Hillary’s team provides Clinton credit for her many actions that led to Qadhafi’s toppling in Libya including, but not limited to: suspending the operations of the Libyan embassy in Washington; evacuating US embassy personnel in Tripoli and closing the embassy there; obtaining sanctions against Qadhafi and his family; working to suspend Libya from the Human Rights Council; appointing Special Envoy Chris Stevens to be the U.S. representative to Benghazi; engaging with UAE, Qatar, and Jordan to seek their participation in coalition operations; holding meetings with House Democrats and Senate Republicans to persuade them not to de-fund the Libya operation; and lastly, it was noted that Hillary worked to construct a $1.5 billion assets package to the National Transitional Council or NTC. Hillary saw this email sent to her from Cheryl Mills because as noted at WikiLeaks she asked for it to be printed in a subsequent email to a colleague. With all the hysterical rhetoric by Hillary Clinton and the Democratic Party this year about “Russia Hacking the US Elections,” it should be pointed out that Clinton’s State Department engineered a complete overthrow of a foreign government in Ukraine. There is also the case of the foul-mouthed Victoria Nuland (photo, left), Assistant Secretary of State for European and Eurasian Affairs – appointed by Clinton and charged with organizing Washington’s 2014 coup d’etat in Kiev. Clinton’s appointee Nuland absolutely key in destabilizing the Ukraine, a move which effectively ruined US-Russian relations, leading us right up to the present geopolitical confrontation over Syria. Nuland happens to also be the wife of Neoconservative founding father and Bush acolyte, Robert Kagan, a signatory of the Project for a New American Century (PNAC), the geopolitical shock doctrine which outlined 9/11, the Iraq War, Afghanistan, Libya and Syria. Not surprisingly, Kagan endorsed Hillary Clinton for president – presumably because he knows she will prosecute the wars required to keep his doctrine’s agenda on track. “I think a no-fly zone could save lives and could hasten the end of the conflict. I am well aware of the really legitimate concerns you have expressed from both the president and the general,” Clinton said in response to a question from Fox News debate moderator Chris Wallace. At present, under the Obama administration, the joint chiefs of staff are opposed to the “No Fly zone”. The Joint Chiefs of Staff are appointed by the Secretary of Defense. Under a Clinton presidency, a new Secretary of Defense as well as a new Chairman of the joint chiefs of staff, firmly committed to “A No fly Zone” over Syria would be appointed. Most considerate and informed commentators now accept that a No Fly Zone is an act of war. Clinton of all people should know this after Libya. Last week, vice presidential running mate, Tim Kaine, said that if elected, Hillary Clinton would press lawmakers to rewrite the Sept. 14, 2001, Authorization for Use of Military Force (AUMF) – making it even easier to ‘go to war’ without having the actually declare war with a Congressional vote. This bill has been a favorite of Obama who has used it as an open-ended executive path to multiple undeclared wars of aggression, and to make his war on ISIS appear legal, for now anyway. This is nothing more than another Washington lawyer’s parlor trick – to pass another AUMF bill to cover the old one. The script just keeps getting revised. “The legislation reflected his national security aides’ desire that it not tie his hands. The document authorized airstrikes in Iraq and Syria in the following three years. It forbade the use of American ground troops in “enduring offensive ground combat operations” — a term the White House described as deliberately vague. It also allowed strikes against “individuals and organizations fighting for, on behalf of, or alongside ISIL” anywhere in the world. Democrats have balked at supporting such a sweeping measure. Republicans have pointed to the three-year limit and the ground-combat language to argue that the AUMF improperly binds the hands of Obama’s successor. A lawyer’s blueprint for a continuation of Washington’s status quo: unconstitutional open-ended, undeclared wars of aggression, anywhere, any time. Like Obama, and Bush before him, and Bill Clinton before them, as president Hillary Clinton will be expected to expedite an establishment agenda written by transnational corporations and other nebulous international crime syndicates. The financial engine for this is the banking houses of Wall Street and the City of London. A basic review of the Clinton’s intimate relationship with Goldman Sachs investment house should provide amble proof of Bill and Hillary’s ties to that circle. This shows how, throughout their career, the Clintons have been owned and operated by these banking houses. Suffice to say, based on this and many other exhibits which we have left out here, Hillary Clinton is a clear and present threat to world peace. This is not to say the Donald Trump presidency will be a halcyon affair either, but we don’t know that yet. This is another problem with this heavily politicized topic in the US. In order to derail any critique of Clinton’s chequered past, many Clinton supporters and die-hard liberal Democrats will try to equate to words of private citizen Donald Trump with the actions of public official Hillary Clinton. If we are having a rational argument then that would simply be a false comparison. If Donald Trump were to assume the office of Presidency, then I would not hesitate to apply as harsh an analysis to his actions and policies. In terms of foreign policy and government corruption – Trump is an unknown quantity, while Hillary Clinton is very well-known one, as we have demonstrated. We have already seen her handy work in both Libya and Syria. Likewise, we have seen the fruits of Bill Clinton’s misadventures in Bosnia, Serbia and Kosovo, not to mention his menacing economic sanctions in Iraq which killed upwards of 1 million Iraqi civilians over a ten-year period, and sowed the seeds for future wars. “We came, we saw, he died!” and proceeded to laugh on camera. The evidence really speaks for itself. The BBC World Service was founded by the Foreign and Commonwealth Office and funded by them directly for six decades, until a cosmetic change last year. Its specific purpose is to spread British values and the British view of the world abroad. It specifically, on its dozens of different national services, gives an opportunity to dissident voices who cannot get on their mainstream media. The Americans spend hundreds of millions annually on outfits like RFE/RL to do the same. Yet when the Russians do precisely the same thing on a much smaller scale, for example by enabling you to listen to me, this is portrayed as evil propaganda. 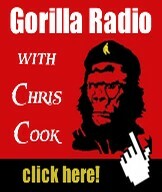 If you would like to listen to some evil Russian propaganda, here is my new interview on Sputnik News. You say “European cultural institutions”, and what should come immediately to mind are lavish concerts, avant-garde art exhibitions, high quality language courses and benevolent scholarships for talented cash-strapped local students. I wrote my short novel, Aurora, after studying the activities of various Western ‘cultural institutions’, in virtually all the continents of the Planet. I encountered their heads; I interacted with the ‘beneficiaries’ of various funding schemes, and I managed to get ‘behind the scenes’. Some, very few countries are almost incorruptible, like Cuba. But Cuba is a unique country. And it is intensively demonized by the Western propaganda. “Patria no se vende!” they say there, or in translation “One does not sell Fatherland!” But one, unfortunately, does, almost everywhere else in the world: from Indonesia to Turkey, from Kenya to India. Aurora opens in a small cafe in an ancient city in Indonesia (which is not called Indonesia). Hans, the German head of an unnamed cultural institute is talking to his local ‘disciples’. He loves his life here: all the respect he gets, those countless women he is sexually possessing and humiliating, the lavish lifestyle he is allowed to lead. A woman enters; a beautiful woman, a proud woman, an artist, a woman who was born here but who left, many years ago, for far away Venezuela. Her name is Aurora. 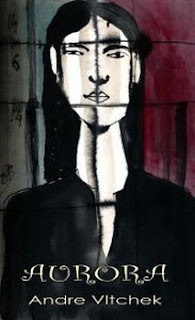 Her husband is Orozco, a renowned revolutionary painter. Aurora’s sister was killed in this country, because she refused to give up her revolutionary art. She was kidnapped, tortured, raped, and then murdered. Hans, the head of a European cultural organization, was involved. Aurora confronts Hans, and in reality, the entire European culture of plunder and colonialism. And that night she is joined, she is supported, by Wolfgang Amadeus Mozart, or more precisely, by his merry ghost, who is thoroughly disgusted of being used as one of the symbols of the ‘culture’ which destroyed him personally, which destroyed the very essence of the arts, and which has been in fact destroying, for centuries, this entire Planet. When I recently shared the plot of Aurora with a local ‘independent’ filmmaker in Khartoum, Sudan, he first listened attentively, and then with horror, and in the end he made a hasty dash towards the door. He escaped, not even trying to hide his distress. Later I was told that he is fully funded by Western ‘cultural institutions’. After reading it, my African comrades, several leading anti-imperialist fighters, immediately endorsed the book, claiming that it addressed some of the essential problems their continent is facing. The cultural destruction the Empire is spreading is similar everywhere: in Africa, Asia and in Latin America. I wrote Aurora as a work of art, as fiction. But I also wrote it as a J’accuse, as a detailed study of cultural imperialism. My dream is that it would be read by millions of young thinkers and artists, on all continents, that it would help them to understand how the Empire operates, and how filthy and disgraceful betrayal is. • Book cover is by Australian artist George Burchett. Andre Vltchek is a philosopher, novelist, filmmaker and investigative journalist. He has covered wars and conflicts in dozens of countries. Three of his latest books are revolutionary: novel Aurora and two bestselling works of political non-fiction: “Exposing Lies Of The Empire” and “Fighting Against Western Imperialism”. View his other books here. Andre is making films for teleSUR and Al-Mayadeen. After having lived in Latin America, Africa and Oceania, Vltchek presently resides in East Asia and the Middle East, and continues to work around the world. He can be reached through his website and his Twitter. Read other articles by Andre. John Pilger, another Australian émigré, conducted the 25-minute interview at the Ecuadorian Embassy, where Assange has been trapped since 2012 for fear of extradition to the US. Last month, Assange had his internet access cut off for alleged “interference” in the American presidential election through the work of his website. John Pilger: What’s the significance of the FBI's intervention in these last days of the U.S. election campaign, in the case against Hillary Clinton? Julian Assange: If you look at the history of the FBI, it has become effectively America's political police. The FBI demonstrated this by taking down the former head of the CIA [General David Petraeus] over classified information given to his mistress. Almost no-one is untouchable. The FBI is always trying to demonstrate that no-one can resist us. But Hillary Clinton very conspicuously resisted the FBI's investigation, so there’s anger within the FBI because it made the FBI look weak. We've published about 33,000 of Clinton's emails when she was Secretary of State. They come from a batch of just over 60,000 emails, [of which] Clinton has kept about half – 30,000 -- to herself, and we've published about half. Then there are the Podesta emails we've been publishing. [John] Podesta is Hillary Clinton’s primary campaign manager, so there’s a thread that runs through all these emails; there are quite a lot of pay-for-play, as they call it, giving access in exchange for money to states, individuals and corporations. [These emails are] combined with the cover up of the Hillary Clinton emails when she was Secretary of State, [which] has led to an environment where the pressure on the FBI increases. JA: I actually feel quite sorry for Hillary Clinton as a person because I see someone who is eaten alive by their ambitions, tormented literally to the point where they become sick; they faint as a result of [the reaction] to their ambitions. She represents a whole network of people and a network of relationships with particular states. The question is how does Hilary Clinton fit in this broader network? She's a centralising cog. You’ve got a lot of different gears in operation from the big banks like Goldman Sachs and major elements of Wall Street, and Intelligence and people in the State Department and the Saudis. JA: So I think you can’t properly understand Hillary Clinton's foreign policy without understanding Saudi Arabia. The connections with Saudi Arabia are so intimate. JP:Why was she so demonstrably enthusiastic about the destruction of Libya? Can you talk a little about just what the emails have told us – told you – about what happened there? Because Libya is such a source for so much of the mayhem now in Syria: the ISIL, jihadism, and so on. And it was almost Hillary Clinton's invasion. What do the emails tell us about that? JA: Libya, more than anyone else’s war, was Hillary Clinton’s war. Barak Obama initially opposed it. Who was the person championing it? Hillary Clinton. That’s documented throughout her emails. She had put her favoured agent, Sidney Blumenthal, on to that; there’s more than 1700 emails out of the thirty three thousand Hillary Clinton emails that we've published, just about Libya. It’s not that Libya has cheap oil. She perceived the removal of Gaddafi and the overthrow of the Libyan state -- something that she would use in her run-up to the general election for President. Not only did you have people fleeing Libya, people fleeing Syria, the destabilisation of other African countries as a result of arms flows, but the Libyan state itself err was no longer able to control the movement of people through it. Libya faces along to the Mediterranean and had been effectively the cork in the bottle of Africa. So all problems, economic problems and civil war in Africa -- previously people fleeing those problems didn’t end up in Europe because Libya policed the Mediterranean. That was said explicitly at the time, back in early 2011 by Gaddafi: ‘What do these Europeans think they’re doing, trying to bomb and destroy the Libyan State? There’s going to be floods of migrants out of Africa and jihadists into Europe, and this is exactly what happened. JA: My answer is that Trump would not be permitted to win. Why do I say that? Because he's had every establishment off side; Trump doesn’t have one establishment, maybe with the exception of the Evangelicals, if you can call them an establishment, but banks, intelligence [agencies], arms companies... big foreign money … are all united behind Hillary Clinton, and the media as well, media owners and even journalists themselves. JA: [Let’s talk about] Donald Trump. What does he represent in the American mind and in the European mind? He represents American white trash, [which Hillary Clinton called] ‘deplorable and irredeemable’. It means from an establishment or educated cosmopolitan, urbane perspective, these people are like the red necks, and you can never deal with them. Because he so clearly -- through his words and actions and the type of people that turn up at his rallies -- represents people who are not the middle, not the upper middle educated class, there is a fear of seeming to be associated in any way with them, a social fear that lowers the class status of anyone who can be accused of somehow assisting Trump in any way, including any criticism of Hillary Clinton. If you look at how the middle class gains its economic and social power, that makes absolute sense. JP: I’d like to talk about Ecuador, the small country that has given you refuge and [political asylum] in this embassy in London. Now Ecuador has cut off the internet from here where we're doing this interview, in the Embassy, for the clearly obvious reason that they are concerned about appearing to intervene in the U.S. election campaign. Can you talk about why they would take that action and your own views on Ecuador’s support for you? JA: Let’s let go back four years. I made an asylum application to Ecuador in this embassy, because of the U.S. extradition case, and the result was that after a month, I was successful in my asylum application. The embassy since then has been surrounded by police: quite an expensive police operation which the British government admits to spending more than £12.6 million. They admitted that over a year ago. Now there’s undercover police and there are robot surveillance cameras of various kinds -- so that there has been quite a serious conflict right here in the heart of London between Ecuador, a country of sixteen million people, and the United Kingdom, and the Americans who have been helping on the side. So that was a brave and principled thing for Ecuador to do. Now we have the U.S. election [campaign], the Ecuadorian election is in February next year, and you have the White House feeling the political heat as a result of the true information that we have been publishing. JA: Look, one of the best attributes of human beings is that they’re adaptable; one of the worst attributes of human beings is they are adaptable. They adapt and start to tolerate abuses, they adapt to being involved themselves in abuses, they adapt to adversity and they continue on. So in my situation, frankly, I’m a bit institutionalised -- this [the embassy] is the world .. it’s visually the world [for me]. JA: So , yes, you adapt. The one real irritant is that my young children -- they also adapt. They adapt to being without their father. That’s a hard, hard adaption which they didn’t ask for. JP: Do you worry about them? JA: Yes, I worry about them; I worry about their mother. Sweden formally writing back to the United Nations to say, ‘No, we're not going to [recognise the UN ruling], so leaving open their ability to extradite. I just find it absolutely amazing that the narrative about this situation is not put out publically in the press, because it doesn’t suit the Western establishment narrative -- that yes, the West has political prisoners, it’s a reality, it’s not just me, there’s a bunch of other people as well. 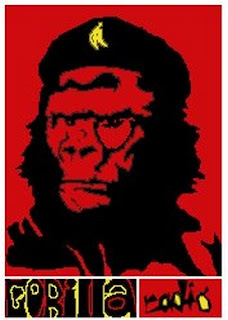 The West has political prisoners. Of course, no state accepts [that it should call] the people it is imprisoning or detaining for political reasons, political prisoners. They don’t call them political prisoners in China, they don’t call them political prisoners in Azerbaijan and they don’t call them political prisoners in the United States, U.K. or Sweden; it is absolutely intolerable to have that kind of self-perception. JA: Here we have a case, the Swedish case, where I have never been charged with a crime, where I have already been cleared [by the Stockholm prosecutor] and found to be innocent, where the woman herself said that the police made it up, where the United Nations formally said the whole thing is illegal, where the State of Ecuador also investigated and found that I should be given asylum. Those are the facts, but what is the rhetoric? JA: The rhetoric is pretending, constantly pretending that I have been charged with a crime, and never mentioning that I have been already previously cleared, never mentioning that the woman herself says that the police made it up. [The rhetoric] is trying to avoid [the truth that ] the U.N. formally found that the whole thing is illegal, never even mentioning that Ecuador made a formal assessment through its formal processes and found that yes, I am subject to persecution by the United States. Do Kirby Corp Tankers Belong in the Salish Sea? Do we really want gargantuan Kirby Corp tankers like the "Dublin Sea" transporting bitumen around the Salish Sea!? Although Kirby is now banned from the BC Inside Passage, pending TSB investigations of their "Nathan E Stewart" disaster, Kirby Corp continues to do business as usual in Canadian Salish Sea waters. Pacific Pilotage Authority CEO, Captain Kevin Obermeyer has told me that currently, the Texas-based Kirby Corporation has had its "special waivers" revoked, and is now forbidden to continue its tanker business up the BC Inside Passage to Alaska. 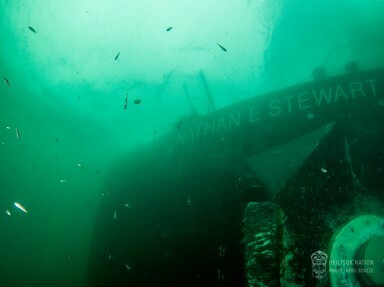 Pending the outcome of Transportation Safety Board investigations of the wreck of its vessel, the "Nathan E Stewart," Kirby Corp will not be allowed in these waters. HOWEVER, the Kirby Corporation is welcome, and continues to ply Canadian waters in the Salish Sea, where it runs much more massive "Articulated Tanker Barge (ATB's) such as the "Dublin Sea" and its massive barge, - which dwarfs DBL 55, the 10,000 ton capacity barge of the Nathan E Stewart. (DBL 55 suffered extensive underwater damage during the Nathan E Stewart incident, and is currently being rebuilt at the Seaspan drydock in Vancouver) Dublin Sea plies between Burnaby's Kinder Morgan bitumen spigot and the giant Tesoro refinery at Anacortes. I expect that the Dublin Sea is loading bitumen from Kinder Morgan's Burnaby spigot, which it then transports right through the very busy Port Metro Vancouver harbour, and then on through endangered Southern Resident Killer Whale habitat, to the Tesoro refinery. When I asked Obermeyer why the Kirby Corp was being allowed to run these massive tankers, -I'm estimating Dublin Sea's barge to be 700 ft long- even while the corporations boats are banned from the BC Inside Passage, his reply was, "..the Kirby vessels plying our southern waters don't get any "special waivers..." - which means they must have Canadian Pilots on board. Well folks, the good Captain's answer was, - shall we be kind?- perhaps a bit disingenuous because: even prior to the Nathan E Stewart disaster, ATB vessels as massive as Dublin Sea, were ALREADY REQUIRED to have Canadian Pilots! Do we really want monsters like the Texas-based Kirby Corporation's "Dublin Sea," loaded to the gunwales with tar-sands dirty-oil bitumen plying through our busy southern waters!? More importantly, Iraq is demanding an exemption from the deal entirely, arguing that it should be allowed to produce as much as possible because of its costly war against the Islamic State. Iran, Nigeria and Libya have been granted exemptions, due to the effect of sanctions (Iran) and disrupted supply because of security issues (Nigeria and Libya). Iraq wants the same treatment. The challenges standing in the way of the deal were evident right after the Algiers announcement at the end of September. Getting all members on board for a production cut was always going to be an uphill battle. But after this weekend, the odds of a deal look increasingly grim. "It's more likely that OPEC will come away with no decision in November than that they'll reach an agreement," Fabio Scacciavillani, chief economist at the Oman Investment Fund, told Bloomberg on Oct 30. "If they are able to agree, it will likely be a wishy-washy deal that's hobbled by too many exemptions." With competing interests, the discord seen over the weekend in Vienna was somewhat predictable. And the results of the fallout are predictable too: oil prices dropped more than 1 percent on Monday during early trading, with both WTI and Brent dipping below $50 per barrel and dropping close to one-month lows. Hedge funds and other money managers cut their long positions on oil futures and increased short bets for the week ending on October 25, a sign that the markets are losing confidence in a deal. "The price balloon is deflating in response to increasing doubts that OPEC will deliver a credible agreement on production control, David Hufton, CEO of brokers PVM Group told Bloomberg. We are living in a time like no other in human history. The environmental decisions we make today and in the next few years will determine our planet's climate stability and the direction of human destiny for centuries to come. Today, we live in a pulse of extraordinary intensity. The rate of change — demographically, technologically, culturally, environmentally — is so fast that yesterday almost seems historical. 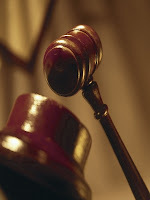 Consequently, each moment becomes pivotal, each decision significant, and each act of amplified importance. We are compelled to such a conclusion by reviewing a globalizing culture that has sped up to a frenzied crescendo, as if everything has accelerated to match the blurring speed of the electron. Human population has been undergoing an unprecedented explosion. Our greenhouse gas emissions are invoking climate alterations that have not occurred for millions of years. Species are dying in the sixth major extinction in our planet's history. Our oceans are warming, acidifying and rising. And all this is caused by human activity, by the decisions we are making and by the things we are doing. It's exciting, even exhilarating. But it's also extremely dangerous. We need to ponder this, and to confront what it means for each of us. Perhaps the first conclusion to suggest itself is that each moment is imbued with a significance that makes us culpable in ways that we have never been before. And history will consequently judge what we have done or did not do, both individually and collectively. So the critical circumstances in which we find ourselves vests each of us with a responsibility that has escaped most others in history. While we will each be judged by our acts of commission or omission, the ones among us who are most obviously responsible will be our political leaders. They will be judged as no others. In such a pivotal point in human history, we have given them the duty to function with the principled and visionary perspectives that will guide us safely through this precarious time. The prime criteria for judgment will be the way in which our leaders address our planet's environment, probably the most critical element in determining whether the edifice we call civilization functions smoothly or fractures into disarray from ecological stresses. Is this a simplification of our challenges? Perhaps. But simplifications are the condensations of complexities that enable us to discern a sense of direction and devise meaningful action. Without simplifications we get lost in a confusing array of conflicting, disparate and distracting details. When we are able to review our history from the perspective of some distant and unspecified future, our present and past leaders will be noted for whether they led us toward or away from the environmental dangers now unfolding around us. This is how they will be judged. And it will be how we will each be judged. 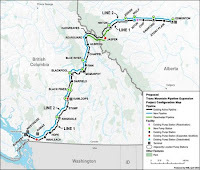 VANCOUVER, BC - A just released federal government report about public meetings held this past summer on the proposed Kinder Morgan pipeline intended to repair massive gaps in public consultation has instead minimized opposition to the project in British Columbia. “The panel report is a slap in the face to all the people who took time out of their summer schedule to share their concerns about this dirty pipeline project,” said Wilderness Committee Climate Campaigner Peter McCartney. 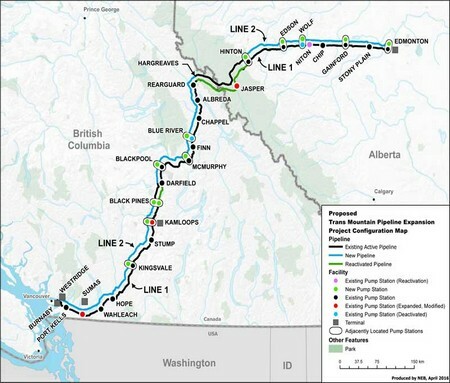 “It is grossly misleading to suggest that there was a balance of opinion in British Columbia when we know 91 per cent of speakers opposed the pipeline,” said McCartney. Despite its deep flaws, the panel report raises a series of critical questions for the federal government ranging from climate change to Indigenous rights to guaranteeing public safety. “At every one of these meetings, citizens overwhelmingly delivered an answer to these questions,” said McCartney. I've been browsing the Kirby Corp website (believe me, environmental activism isn't all about fame, fortune and glamour as it is for some...) and although there's a whole lot of bravado about being America's biggest water-borne petroleum distributor, which specializes in such deliveries as heavy fuel oil, black oil, crude oil, bunker fuels, petrochemicals, as well as ethanol, gasoline, diesel and agricultural chemicals, there's no mention of the Kirby Corps $40,000,000-and-counting Nathan E Stewart adventure. Kirby's website is loudly emblazoned with its motto, -"Putting America's Waterways to Work,"- as well as considerable blather about "safety" and its commitment to "environmental excellence," but there is not a single mention, nothing whatsoever, on the currently unfolding shipwreck story and subsequent petroleum slick disaster that Kirby Corp is responsible for. And, I guess not surprisingly, there is utterly no mention of the Kirby Corps other recent massive oil spill into Galveston Bay, which polluted 200 miles of Texas shoreline, and for which Kirby Corp was found guilty of in court. Instead, the Kirby Corp website is focused on advertising its presentations at a whole line-up of upcoming investor conventions as well as detailed analysis of its stock market values, profits and expansion plans. (pure glamour, all this, eh?) Come to think of it, perhaps Kirby Corp investors might, in fact have second thoughts if the corporation was honest about the environmental, economic and social disasters the Kirby Corp leaves in its wake. And you know me, - being very concerned about the bottom line of business investments being wagered by the rich-piggiest one-percenters oil-business investors, I took it upon myself to search out the Texas news media to see how Kirby Corps Nathan E Stewart disaster was playing out in the Texas media. Heiltsuk Call Trudeau: "Come to Bella Bella"
Stand with us while we’re in a great time of difficulty. Stand with us as you said you would during our reconciliation discussions. Make good on your word. We implore you to come. We will embrace your visit here in Bella Bella. When Minister LeBlanc was here last weekend he alluded on video that a moratorium on tanker traffic for the Northwest coast of British Columbia would be immediately forthcoming. Minister Garneau will be here on Sunday, November 6 to bear witness to the spill, meet with community leaders, and make announcements about ways forward. We invite Prime Minister Trudeau to join him in Bella Bella and make good on his campaign promise to instate a moratorium on oil tanker traffic on the northwest coast. For the Heiltsuk, the running aground of the Nathan E. Stewart tug boat, which was carrying the 10,000 tonne fuel barge DBL 55 south to refill, should serve as a wake-up call to the federal government as to the woefully inadequate state of our spill response systems. While the cause of the accident is still shrouded in , it is clear that a long list of human mistakes led to the disaster, which has closed local fisheries indefinitely. The aftermath of the spill, during which the Heiltsuk have played a leading role in cleanup efforts, has shown how poorly booms, salvage equipment and clean-up vessels respond to the challenging weather conditions of the BC Coast. “A moratorium on oil tanker traffic in this region was the cornerstone of Prime Minister Trudeau’s environmental platform during the 2015 election,” said a Heiltsuk media advisory. Community members were disappointed when the prime minster cancelled plans at the last minute to join the Royal Visit to Bella Bella. “We felt that would have been a real signal of nation-to-nation reconciliation,” said Slett. “My analysis is that Trump would not be permitted to win. Why do I say that? Because he has had every establishment off his side. Trump does not have one establishment, maybe with the exception of the Evangelicals, if you can call them an establishment,” said Assange. Not exactly the scene John The Baptist would expect at a morning water ceremony. The land they were heading to was Army Corp land which the police do not have jurisdiction, and the water is neutral territory. Everything about the police actions today shows nothing but corruption, and treason against the US government, and the treaty rights they have signed, and sworn to uphold. Welcome to America. The American dream is a police state. So you joined law enforcement or the National Guard because you wanted to uphold the law, protect innocent civilians against the bad guys, and help your community in times of need. 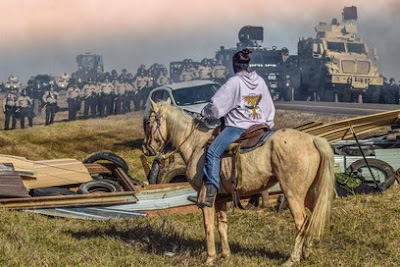 Instead, they’re having you blockade unarmed people who are trying to hold a prayer vigil, chasing them with armored vehicles and ATVs, raiding their tipis and sweat lodges at gunpoint, and shooting them (and their horses) with pepper spray, concussion grenades, tasers, and rubber bullets. You thought you’d be the cop on the beat or the citizen soldier, and they’ve made you into the cavalry riding in with Custer. The religious rights of Native people are further enshrined in the Indian Religious Freedom Act and the Native American Graves Protection and Repatriation Act, both of which have been literally plowed under by the Dakota Access Pipeline. Energy Transfer Partners and Enbridge even hired private security goons, who on September 3 unleashed attack dogs on Native people praying to “petition the Government for a redress of grievances.” On October 27, praying people holding tobacco and sage had their arms stomped until they released the offerings. Impersonal numbers were written on the arms of the arrestees, who were held in dog kennels. Genuine law enforcement or military wouldn’t take sides or turn a blind eye to these shameful violations of constitutional rights, but protect the lives and property of all residents, whether Native or non-Native. If you deny others their humanity, you lose your own humanity. Yes, some of the water protectors are trespassing on private property and locking themselves to pipeline construction equipment. Their actions are part of a long tradition of nonviolent civil disobedience in the face of tyranny, from Henry David Thoreau to Martin Luther King Jr. Remember the Boston Tea Party, in which rebellious Americans posing as Indians took direct action against British tea taxes? The only real difference at Standing Rock is that they’re not posing as Indians. When we visited there, we met many prayerful people who were justifiably angry—what if an explosive oil pipeline or train threatened your home, your drinking water, or your kids’ school? Yes, many of the water protectors are from out of state, but they were invited by the Standing Rock Sioux Tribe, with one of the conditions that they don’t have weapons. The state of North Dakota has invited out-of-state armed police and unaccountable private security thugs, all to defend a corporation from Texas. Some of the police have come as far as Ohio and Wisconsin (and what self-respecting Packers fan would side with a corporate franchise based in Dallas?). Why is that that armed white militia members, from out of state and uninvited, are acquitted in Oregon, but invited, unarmed Native people are being criminalized and assaulted in North Dakota? 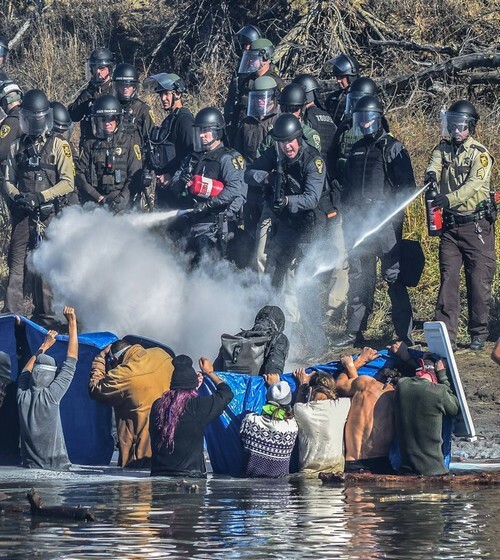 The trend of state security forces being turned into private corporate security is hardly unique to North Dakota. In his book Resource Rebels, Al Gedicks documents how Nigeria set up a special internal security force to crush Ogoni protests against oil leaks and pipeline explosions. Shell Oil not only admitted funding and arming the military force, but provided access to its boats and helicopters. The commander of the force wrote that Shell operations would be “impossible unless ruthless military operations are undertaken for smooth economic activities to commence.” When Ijaw women led protests against Chevron’s oil pollution, the company flew in police and military personnel that killed unarmed protesters. Gedicks also documented how in Colombia, “human rights abuses have risen dramatically in the areas with the most intense oil activity,” such as death squad killings and disappearances. BP and Occidental contracted with military units and private security firms to guard their oil pipelines, and BP gave photos and videotape of Indigenous community organizers to Colombian military units, which proceeded to arrest and kidnap them as “subversives.” One army unit even sported a shoulder patch with an oil derrick. In Ecuador, police and military units have recently repressed protests by Amazon Indigenous communities against oil drilling and oil access roads in the Yasuní rainforest reserve. The repression echoes previous governments’ militarization around ARCO and Texaco drilling operations, including detention without charge and torture. Are these the kind of security forces that you’d be proud to be part of, merely appendages of Big Oil? These governments criminalize dissent not because they’re afraid of illegality; it’s because they’re afraid of legal dissent winning the day. They know, just as North Dakota Governor Dalrymple knows, that if the movements grow and gather support, they have the power to stop oil pipelines from damaging their land and water. It seems impossible that the mostly-built $3.7 billion Dakota Access Pipeline could be defeated. But that’s what happens when industries go into decline–corporations lose some of their enormous profits. The Bakken oil fracking boom is already starting to bust, from lower oil prices and declining well yields. When the nuclear power industry similarly went bust in the 1980s after the Three Mile Island accident, utilities abandoned mostly-built reactors worth up to $2.5 billion ($6 billion in today’s dollars). Why violate treaties and the Constitution for a pipeline that may carry less oil than anticipated, and eventually none at all? In a so-called “free enterprise” system, it’s not your job to prop up energy companies and guarantee returns for their shareholders. It’s your duty to defend the Constitution. In North Dakota, National Guard personnel are ordered to staff checkpoints, with concrete barriers and lights modeled on Traffic Control Points in war zones like Iraq. At least one of the private security firms guarding the pipeline, TigerSwan, has also worked in Iraq and Afghanistan. Police officers are given trainings that demonize citizens exercising their First Amendment rights as the enemy, and are deployed to prevent legal demonstrations from taking place, even on public property. Outside agencies come in with hyped-up intel briefings and sensationalized scary videos that blow a few of the pipeline confrontations out of proportion. But guess what? If the Native water protectors continue to be injured or worse, the conflict will only polarize and escalate, and you (and your department) will be left holding the bag. After the outside briefers fly home, you’ll be left with the public relations disasters, crippling security costs, and expensive lawsuits. And are you absolutely certain that your own department won’t hang you out to dry, by refusing to stand behind its “bad apples” who violently violated constitutional rights? For Guard personnel, the Uniform Code of Military Justice (Article 92) establishes a duty to obey lawful orders, but also a duty to disobey unlawful orders to that are clearly contrary to the Constitution. “I was just following orders” is not a legal defense for harming or violating the rights of civilians. If you feel you are being given an unlawful order to do so, you can legally send an “appeal for redress” to Congress that is protected under the Military Whistleblower Protection Act. You probably know quiet, creative ways to “work-to-rule,” and share vital information about unlawful actions, to help slow down the madness. And if in doubt, you can always kneel and pray for guidance. A PDF leaflet of this letter can be downloaded here.